In view of the success of Question of The Week (QOTW), I thought we should have a scientific image of the week. Please keep these scientifically relevant. 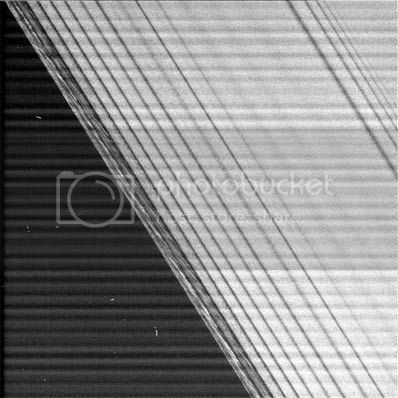 Each image should be accompanied by a few lines of description, and a reference / acknowledgement of the source if it is not yourself. 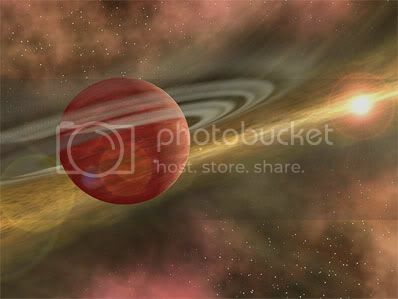 Please do not converse about the photos in this forum, it's intended as an image library. Instead start a separate thread to discuss them. I reserve the right to remove inappropriate images or comments. "Residents of Tainan learned a lesson in whale biology after the decomposing remains of a 60-ton sperm whale exploded on a busy street, showering nearby cars and shops with blood and organs and stopping traffic for hours." 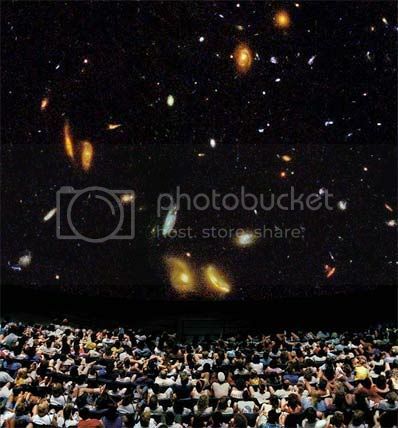 unique shape and color as seen with ground-based telescopes. structures in tissue from diseased human arteries. don't fully develop until young adulthood. 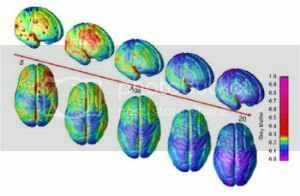 prefrontal cortex, which handles reasoning and other "executive"
functions, emerged late in evolution and is among the last to mature. areas is less influenced by heredity than areas that mature earlier. Sources : Genome News Network (top), CDC (Centres for Disease Control and Prevention) (below). The virus is a relative of the common cold and first appeared in China in late 2002.
smaller-scale atmospheric features are also becoming visible. 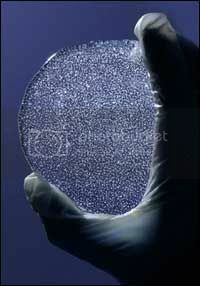 nanometers. The image scale is 157 kilometers (98 miles) per pixel. Contrast in the image was enhanced to aid visibility. Scientists have successfully drilled through an Antarctic ice sheet to extract the longest ice core ever recovered, according to a report published today in the journal Nature. The cylinder of ice dates back nearly three quarters of a million years and will help researchers better understand our planet’s history of cyclical climate variation. "This has the potential to separate the human-caused impacts from the natural and place it in a much clearer context," explains James White of the Institute of Arctic and Alpine Research at the University of Colorado at Boulder, who was not involved in the research but penned a commentary on the find for this week’s issue of the journal Science. The mysterious moon is an outsider, lying further out than any of Saturn's other major moons, and being the only major moon to orbit backwards. Because of these quirks it has been suggested that Phoebe was either an asteroid or comet captured by the giant planet's gravitational field. 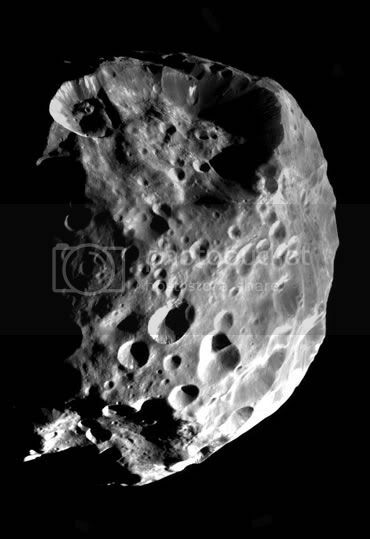 The new pictures show that most of the moon is dark, but impacts have blasted holes in the surface to reveal much brighter material underneath, which is probably a mixture of ices. So Phoebe looks like a dirty snowball - the term coined to describe comets. An insect that normally inhabits warm countries has been found living and breeding in the UK, entomologists say. 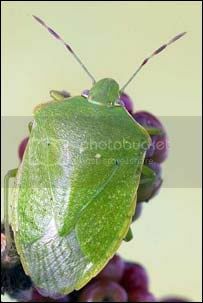 The green "shield" bug, which attacks a broad range of crops, is usually seen in the Mediterranean, Middle East, Australia, North America and Africa. Its arrival in Britain is a clear sign of climate change, claim experts from the Natural History Museum, London. "I'm always reluctant to invoke global warming but it's the only explanation," said curator of beetles, Max Barclay. The green vegetable bug (Nezara viridula) is similar to the UK's native green shield bug (Palomena prasina), but is paler in colour and has a longer, narrower shape. Also, unlike its British cousin, the green vegetable bug has no brown markings. The insects - sometimes known as "stink" bugs, because of the foul odour they emit when threatened - are regular stowaways to the UK. They often get shipped in with imported vegetables but, until recently, they have not been able to stand Britain's cold climate. Now three healthy colonies have been found in London - two in the Queen's Park area and one in Kings Cross. SpaceShipOne, the first private manned spacecraft, is undergoing final preparations before its historic flight to the edge of space on Monday. The craft, built by aviation pioneer Burt Rutan, will be launched into the sky by its carrier, White Knight, then rocket upwards to 100km (62 miles). No private craft has ever been so high. In May, it reached 64km (40 miles) in a test flight, doubling its last best. "It's all been done privately on essentially a shoestring budget compared to what the governments spend," former Nasa astronaut Rick Searfoss told the BBC. "It's a whole different model and we should all be excited about the prospects it can lead to." The attempt over California's Mojave Desert is due to launch at 1330 GMT. On Monday, SpaceShipOne will attempt to become the first private vehicle to take an individual above the Earth’s atmosphere. The rocket plane, developed in just a few years by the Californian company Scaled Composites, has room for a pilot and two passengers. The passenger seats will be empty for the first space flight. 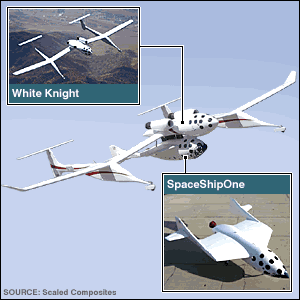 SpaceShipOne is carried to more than 14km (47,000ft), slung beneath the White Knight craft. 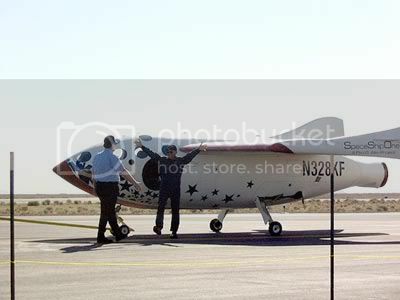 SpaceShipOne is then released and glides for a few seconds before the pilot lights the rocket and points the vehicle straight up. Its speed will exceed Mach 3 (three times the speed of sound). 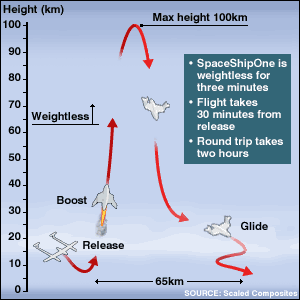 SpaceShipOne will just break the Earth’s atmosphere. 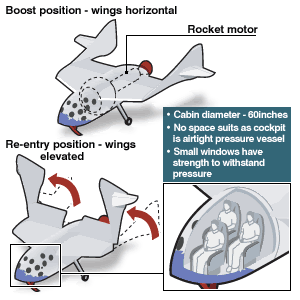 The pilot will experience three minutes in a near-weightless environment. At the top of its flight, the vehicle must adjust its wings into a high-drag configuration so that when it falls back to Earth its speed is controlled and heating of the airframe is minimised. 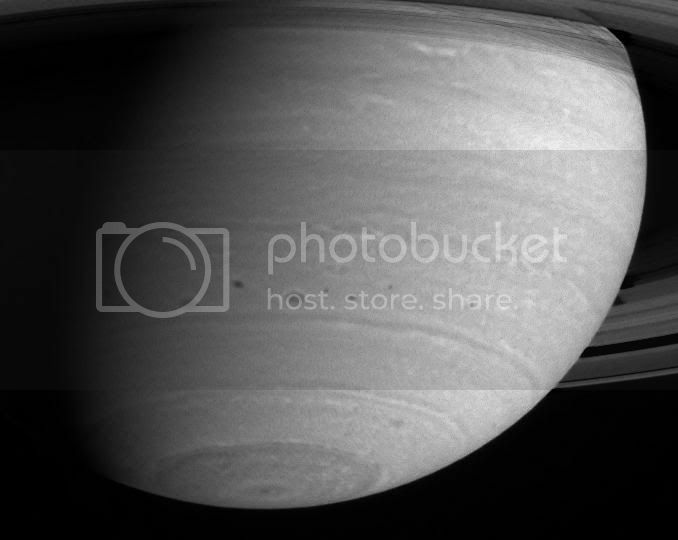 Close encounter: The Cassini spacecraft has captured this image of Saturn. AUSTRALIA will be the ears of the world when a tiny spacecraft named Cassini completes a seven-year journey to Saturn on Thursday. Cassini will fly through Saturn's outer rings to establish itself in the planet's orbit early on Thursday afternoon. The Canberra deep space communication complex at Tidbinbilla will tune its three main antennas to pick up the faint success signal. Cassini will spend four years orbiting the planet taking pictures and analysing the composition of its rings, moons, how the planet was formed and why it has rings. Cassini fires its engine to enter orbit around Saturn as illustrated in this artist's concept. Flight controllers at NASA's Jet Propulsion Laboratory in Pasadena, Calif., sent final commands to Cassini over the weekend, setting the stage for main engine ignition at 10:35:42 p.m. Wednesday. To achieve orbit around Saturn, the 12,600-pound Cassini must reduce its velocity by about 1,400 mph using a rocket engine that only produces 100 pounds of push. As a result, the engine must fire for 96.4 minutes to put Cassini into the desired orbit. If the engine shuts down early, the computer will switch to a spare. But the end result must be roughly the same - 96 minutes of braking - or Cassini might not be able to achieve its long-awaited mission. NASA's $3.3 billion Cassini probe completed a seven-year, 2.2-billion mile voyage tonight, firing its main engine for a nerve-wracking 96 minutes to successfully brake into orbit around the ringed planet Saturn. Throughout the all-or-nothing rocket firing, flight controllers at NASA's Jet Propulsion Laboratory in Pasadena, Calif., could only sit and wait, monitoring events that had already taken place 934 million miles away. At that distance, radio signals, moving at 186,000 miles per second, needed an hour and 24 minutes to complete a one-way trip between Saturn and Earth. As a result, Cassini's on-board computer was responsible for carrying out the most critical maneuver since launch Oct. 15, 1997, a maneuver that simply had to work or the mission would end in failure. To everyone's relief, Cassini's main engine fired up on time at 10:36 p.m. EDT and shut down at 12:12 a.m., putting the craft in its planned initial orbit around Saturn. 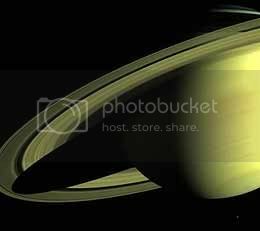 The first batch of photographs snapped by the Cassini Saturn orbiter earlier today reached the Jet Propulsion Laboratory around 8:30 a.m., zoomed-in shots of the planet's myriad rings showing a ghostly tapestry of icy, back-lit particles arrayed in sharply defined bands. Much brighter shots showing the rings from the sunlit side were expected to reach Earth later this morning, but scientists were elated at the initial results. "Look at that structure, it's so regular!" marveled imaging team leader Carolyn Porco as a picture came in showing well-defined bands of brightness and darkness. "I'm wondering if we're looking at a density wave. This looks like it might be a density wave, but I'm not quite sure." Density waves, caused by gravitational interactions with nearby moons, are thought to be "kissing cousins" of the waves that produce the spiral structure seen in galaxies like Earth's Milky Way. A powder that exploits the natural stickiness of honey bees could help control a devastating insect pest. The Varroa mite is endemic in British hives and in large numbers can sap a bee colony's strength. The powder has proved useful in helping spread chemical anti-mite agents much more widely around a hive than other mite-controlling substances. A Varroa species of mite was first discovered in Britain in 1992 but was thought to be present in hives long before then. The first outbreak devastated honey bee numbers, with many keepers losing up to 75% of their colonies. Chemical controls known as pyrethroids have proved effective in controlling Varroa but lax use has produced mites resistant to them. Beekeepers fear this means mite numbers are set to boom again leading to more lost colonies. But now Southampton-based Exosect has developed a novel way of distributing another Varroa-controlling chemical around hives. The Exomite system uses a powder that can be made to stick to the bee by exploiting its natural electrostatic charge. The wax powder being used as a carrier medium is a harmless food grade substance. The charged powder can be dosed with oils, such as thymol, used in other anti-mite products.